The very last preparations are underway for the curtain to rise on Festival Mediterranea 2017 - the sixteenth edition of this annual celebration of high culture that again turns all eyes on our island's artistic bonanza. The Festival kicks off on Thursday, the 26th of October, with the first of two renditions of Gaetano Donizetti's beautiful masterpiece, "Lucia di Lammermoor", which will undoubtedly delight the audience that is expected to throng the Teatru Astra on both nights. The second and final rendition of the opera takes place two days later, on Saturday, October the 28th. The Gozo Channel Company Limited has announced that it will run a special ferry trip at midnight on the day of both performances to accommodate the patrons traveling from Malta. The opera is supported by other cultural and educational events, including a musical recital on Friday the 27th, at the Kempinski Hotel in San Lawrenz. The concert features soloists Mario Galea (clarinet), George Camilleri (euphonium) and Robert Buttigieg (trumpet), accompanied on the piano by pianist Francis James Camilleri. At this event, Mario Galea will be interpreting two major twentieth century works on the clarinet: Malcolm Arnold's "Sonatina"and Francis Poulenc's "Sonata". Robert Buttigieg interprets works by Gershwin, Busser and Höhne on the trumpet. George Camilleri plays Berlioz's "Recitative and Prayer" on the trombone and the first movement from Joseph Horowitz's "euphonium concerto", finishing with the popular "Napoli Variations". Francis Camilleri also plays Chopin's "Scherzo in Bb minor". Entry to this concert is free of charge. On the morning of the second performance of "Lucia di Lammermoor", that is on Saturday, the 28th of October, opera expert Dr Abraham Borg presents a public lecture on the subject, themed "Betrothed Among The Ruins", at Vini e Capricci, situated in the complex Gozitano. Event starts at 10:00 and, like in the previous, participation is free of charge. 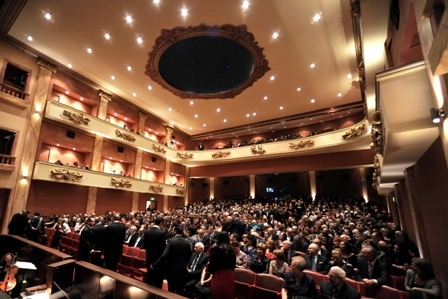 The opera is supported by the Gozo Cultural Support Programme. Reservations and bookings can be made through the festival helpdesk on 21550985 and online on www.teatruastra.org.mt.